Alfred Hirv went to St. Petersburg when he was only 15 years old and two years later, the local society of artists presented a proposal to the young talent to participate in their exhibition. Hirv agreed. He briefly displayed his works in Tartu and Tallinn as well but was too international at heart to move to Estonia. Before settling down permanently in St. Petersburg, he spent time in Rome and Munich (later on in Paris and Spain as well) and gradually, Hirv’s favourite genre unfolded: still lifes created in the old Dutch tradition. True, he is also known to have painted portraits, semi-nudes and even figurative paintings, which have never been particularly cultivated in Estonian art. Hirv’s mild and naturalistic style found many admirers in St. Petersburg and Hirv, who now signed his works in Cyrillic as “Girv”, was extremely popular until his premature death in 1918 cut short his successful career. 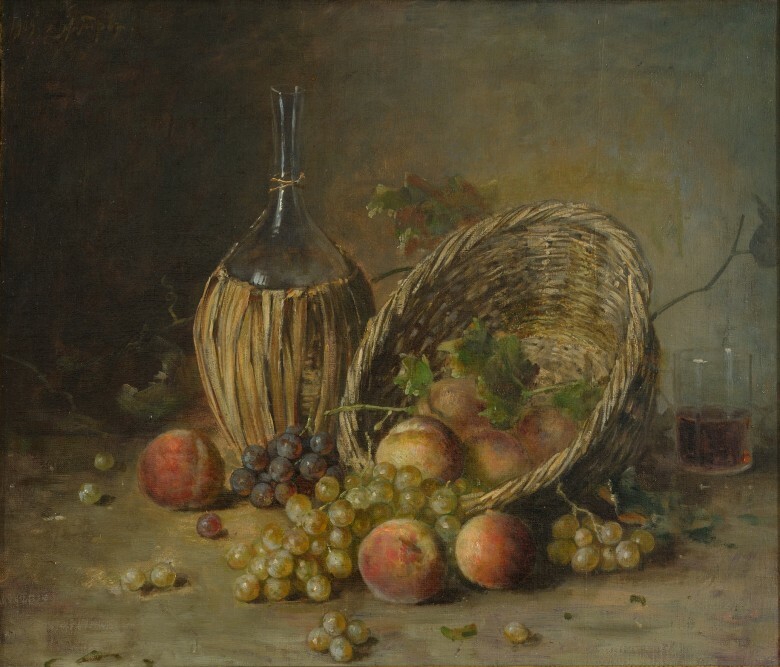 We see a classical still life in this painting, where there are several elements that recurred in Hirv’s works: a bottle, grapes, a basket, and so on. Not one of these objects found its way into this composition by chance. Hirv, who often painted a postcard-sized preliminary sketch before starting work on the painting, very carefully composes this composition of objects, where every item should be in its proper place.